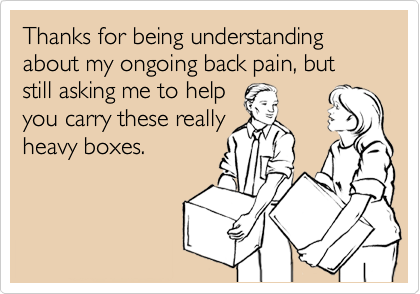 Back pain is an area surrounded by myths, often perpetuated by well meaning people including some health professionals. However recent scientific research is challenging many of the widespread beliefs held about this condition. The following are the fifteen best pieces of advice for back pain based on research evidence. Eighty percent of people will experience an episode of back pain during their lifetime. Experiencing back pain is like getting tired or becoming sad; we don't necessarily like it, but it occurs to almost everybody at some point. What isn't common, however, is not recovering from back pain. Most acute back pain is the result of simple strains or sprains and the prognosis is excellent. Within the first two weeks of an acute episode of pain, most people will report a significant improvement in their symptoms with almost 85 percent of people fully recovered within three months. Only a very small number of people develop long-standing, disabling problems. It is intuitive to want to see what the problem is and both healthcare professionals and members of the public often consider getting a scan "just in case" there is something serious involved in their pain. However, all the evidence suggests scans only show something truly important in a tiny minority (<5%) of people with back pain. A brief consultation with a healthcare professional (eg GP, physiotherapist) would usually be able to identify if a scan was really needed based on a person's symptoms and medical history. When people have imaging scans for back pain, the scans often show up things that are poorly linked with pain. In fact, studies have shown that even people who don't have back pain have bulging discs (52%), degenerated discs (90%), herniated discs (28%) and visible 'arthritic' changes (38%). Remember, these people do NOT have pain! So the link between changes seen on imaging scans and back pain is very weak. Unfortunately, people with back pain are often told that these observed changes indicate their back is damaged, and this can lead to fear, distress and avoidance of activity. The fact is that many of these things reported on scans are more like baldness - an indication of ageing and genetics that do not have to be painful. Despite a lot of people looking very hard there is no evidence that back pain is caused by a bone or joint being out of place, or your hips and pelvis being out of alignment. For most people with back pain, scans do not show any evidence of discs, bones or joints being 'out of place'. And in the very small number of people with some change in their spinal alignment, this does not appear to be strongly related to back pain. Why then do many people feel better after undergoing treatments like manipulation? This is due to short-term reductions in pain, muscle tone/tension and fear, NOT due to realigning of body structures. This may seem strange, but we now know that more pain does not always mean more damage. Ultimately, two individuals with the same injury can feel different amounts of pain. The degree of pain felt can vary according to a number of factors, including the situation in which the pain occurs, previous pain experiences, your mood, fears, fitness, stress levels and coping style. For example, an athlete or soldier may not experience much pain from an injury until later when they are in a less intense environment. Furthermore, our nervous system has the ability to regulate how much pain a person feels at any given time. If a person has back pain it might be that their nervous system has become hypersensitive and is causing the person to experience pain, even though the initial strain or sprain has healed. This can mean the person feels more pain when they move or try to do something, even though they are not damaging their spine. Once people with back pain can distinguish between the 'hurt' they are feeling from any concerns about 'harm' being done to their back, it is easier to participate in treatment. Only a tiny proportion of people with back pain require surgery. Most people with back pain can manage it by staying active, developing a better understanding about what pain means, and identifying the factors which are involved in their pain. This should help them continue their usual daily tasks, without having to resort to surgery. And on average, the results for spinal surgery are no better in the medium and long-term than non-surgical interventions, such as exercise. Many people believe that children carrying a heavy schoolbag might cause back pain. However, research studies have not found this link, revealing no differences in schoolbag weight between those children who do and do not go on to develop back pain. However, if a child - or their parent - believes that their schoolbag is too heavy, the child IS more likely to develop back pain, highlighting the importance of fear in the development of back pain. Should we all sit up straight? Contrary to popular belief, no specific static sitting posture has been shown to prevent or reduce back pain. Different sitting postures suit different people, with some people reporting more pain from sitting straight, others from slouching. So while slouching is critcised, there is no scientific evidence to support this. 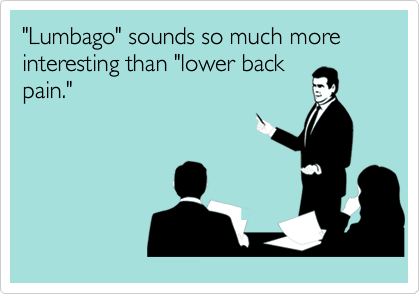 In fact, many people with back pain can adopt very rigid postures (eg sitting extremely upright) with little variation in their pain levels. While a lifting or bending incident could initially give a person back pain, bending and lifting is normal and should be practiced to help move the back and promote confidence, similar to returning to running and sport after spraining an ankle. When someone has pain, a good night's sleep can be hard to get. However, it works both ways as sleep problems can lead to back pain in the future. In the same way that poor sleep can make us more stressed, give us a headache, make us tired or feel down, it can also cause or prolong back pain. So, improving sleeping routine and habits can be very helpful in reducing back pain. All types of exercise are good, with no major differences in effectiveness between them - so pick one you enjoy, can afford and which is convenient. However, this is very common as most treatments only address one factor, for example someone goes for a massage for their sore muscles, but doesn't address their sleep or fitness or stress levels.